The president signed three documents soon after his swearing in Tuesday. WASHINGTON (CNN) - As his first official action after being sworn in, President Barack Obama signed three documents Tuesday, including a proclamation declaring a day of national renewal and reconciliation. "I'm a lefty. 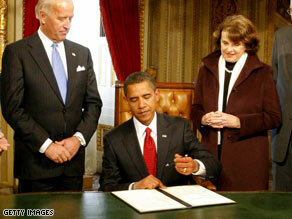 Get used to it," Obama quipped as he signed his name. "I was told not to swipe the pen." The past three presidents signed similar reconciliation proclamations upon being sworn in. Let's undo every sorry thing Bush has done. Please. I can't wait to start picking apart all of Obama's decisions. It is going to be fun being on the other side for a change....giving the bashing and name calling. why is it that "God" should bless america and not the world. i also think having a religious ceremonies at state events such as the inauguration is bias. if the president is so religious he should practice such thing in his private time. he is the president of the US which is full of people from all form, religion, color, and beliefs. this completely violates the constitution because it does not separate religion and state! i personally feel neglected during the opening prayer! we believ that you will make this country a better place! Though too much to hope for, I wish all could just celebrate the historical significance of today. The election of our 44th president shows just how far our country has come. None of us will ever be in total agreement with the politics espoused by our elected officials, but we can be thankful we have the right to vote our beliefs, without being angry and disrespectful. I personally wish former President Bush and his wife a good life, and will support our new President as he tries to overcome the many problems our country is facing. Bush already sunk this ship. hi obama your my best presedent anyone can have im african amarican and im arabic bye i hope you send me some thing back ok bye ??????????? ALL I HAVE TO SAY TO ALL WHO HATES OR DISAGREES WITH THIS NEW PRESIDENT IS EITHER YOU ARE AN AMERICAN OR NOT AND IF YOU CALL YOURSELF AN AMERICAN THEN BARACK OBAMA IS YOUR PRESIDENT PERIOD END OF SENTENCE AND IF YOU DON'T LIKE IT MOVE SOME PLACE ELSE. Awesome Day! My favorite part of the day were the preachers. Warren and Lowery delivered. In those moments of silence where their singular voice was heard, America felt united. I was praying with the tv. And Mr. Lowery, you are the jewel of GA. I just love your presence. I am so inspired as so many others are with this new President. The world is sooo happy. We have finally embraced ALL Americans of all races, religions, ethnicities, etc. I love the Democratic party for this bold and great move that they took this past election. And my fellow Americans for voting President Obama in. God bless this President and his family!!! God bless America! If Obama were a Jew, he would place his hand on a Torah. If he were Islamic, he would have used the Koran and so on and so on. Come on, People, what is the sense of quibbling over what should go without saying. I'm not a Christian, but I would be surprised if he called on the Great Spirit instead of his Bible. Come on, get real! What business of anyone how he sees the Creator... way too personal, People! Your Jesus said, go into your closet and pray.... and inner place within your heart! For everyone hoping Pres. Obama does a great job, that he changes things for us. PLEASE PAY ATTENTION TO WHAT HE"S SAYING!!! So what are you going to do to make a change? Are you going to get more involved in Govt., your childs school, the community? Get up Get Out and get to work changing this country.